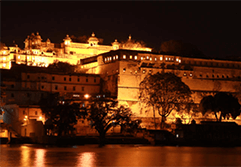 The well- organized evening Sound and Light Show here is a fascinating attractions of the Amber Fort, with its rocky walls provided with an energetic backdrop for the light- effects. Made exciting by repeating of the various stories and legends of the Rajput Kings attended by harmonious folk music. They tell you the story of Rajputs’ and explain and the attractive narration takes you through the memory lane of Amer, describing its traditions and the grand lifestyle of the royal family. The narrative of the fort’s glorious past is voiced by Amitabh Bachchan, the most distinctive voice in Indian cinema. This show starts on every evening at Kesar Kyari. 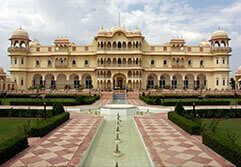 One of the most magnificent destination located on the hills just outside Jaipur. It was built by Raja Man Singh in 1600 AD and then completed to its present form by Sawai Jai Singh in the eighteenth century. The fort is an example of fascinating blend of Hindu and Muslim architecture built in red sandstone and white marble, the highlight of the fort is the Seesh Mahal (mirror Palace), a palace known for its craftsmanship in mirrors. It also locates in itself large ramparts, terraces, gardens and pavilions. 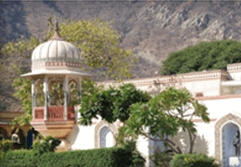 Nahargarh, adobe of the tigers was built by Jai Singh to bolster the defense of Amer. 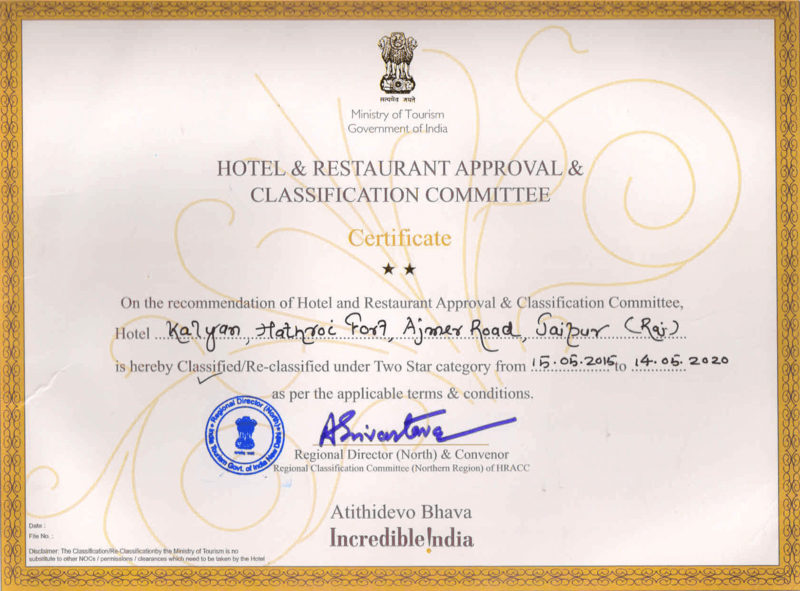 The fort is located on the rugged Aravali Hills. The fort has uniquely a cluster of 12 suits for queens and at the head is a suit for the Jai Sigh himself. 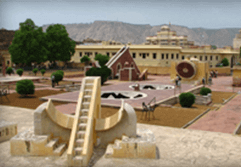 Jantar Mantar, one of the five observatories (the others being in Delhi, Ujjain, Varanasi and Mathura ), built by Sawai Jai Singh. He was an avid astronomer & buit it to study movements of stars it in 1718. The observatory contains a large no of structures called ‘yantras’ which are instrument to determine position of stars and the steller movements. An impregnable and un-approachable fort. The fort was cleverly built to gives its archers an advantage over their targets. 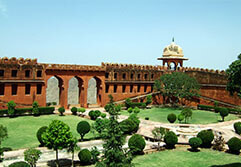 It is said that Raja Man Singh has buried huge treasures in this bastion. The fort also houses the Jai Ban the largest cannon in Asia, supposed to have been test fired only once. Sawai Pratap Singh, built the Palace of winds and air in 1747. The palace is though not in air but it is a façade, which is fifty feet in height and a mere one foot in width. The screen allowed the ladies of the palace to have view of the market place below. 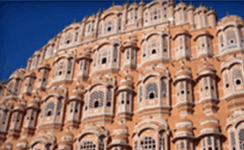 Today Jaipur is symbolized by Hawa Mahal. This is a traffic roundabout In Jaipur. 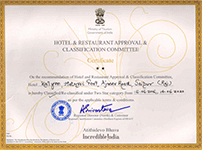 It is the favourite lounge of Jaipur and a place for evening out, with ‘Meals on Wheels’ standing by. Strangely it acquires its name of statue circle after its figurine rather than the grand Sawai Jai Singh the founder of modern day Jaipur. In the middle of Jaipur rises a small hill Moti Dungri meaning pearl hill, because it looks hill a drop of pearl. 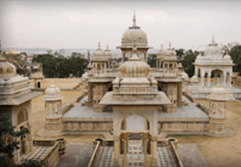 An exotic palace is parched which is a replica of Scottish castle once occupied by Maharaja Madho Singh’s son. 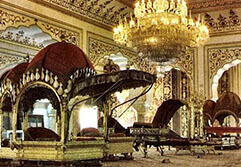 It is the final resting place of the Maharajas of Jaipur and is located just off the Jaipur – Amber Road. Situated in a narrow valley the cenotaphs of the former Maharajas are chhatris made in typical Rajput architecture. 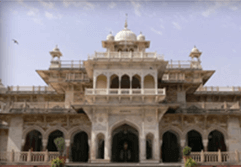 The chhatri of Sawai Jai Singh II is of special mention for its carvings that exaggerate it. Also known as Water Palace, Built in the mid 18th century by Madho Singh I The Palace was developed as a pleasure spot and was used for the royal duck shooting parties. 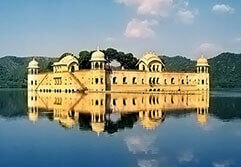 A causeway leads to Jal Mahal Palace situated in the middle of Man Sagar Lake, opposite the cenotaphs. Situated in the middle of the Ram Niwas garden, as a centre attraction was the exquisitely built structure of Albert Hall, which was designed by sir Swinton Jacob, a British architect who designed many palaces in Rajasthan. Combining the elements of English and north Indian architecture known as the pride of the New Jaipur opened in 1887 AD, it is a very well maintained and impressive building displaying a rich collection of Art- de- fact like paintings, carpet, ivory, stone and metal sculptures and colourful crystal works etc. The Birla Planetarium is at the BM Birla Science & Technology Centre, near Statue Circle. The Planetarium offers unique audio-visual educational and entertainment with its modern computerised projections system. A vital part of the city Palace complex, this Krishna temple has been highly preserved by the erstwhile royal family. 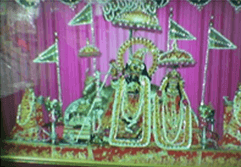 Sawai Jai Singh installed the image of GOVIND DEV JI (an incarnation of lord Krishna) after it was brought from Vrindavan. 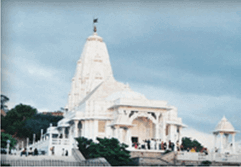 Birla Mandir or the Lakshmi – Narayan Temple, situated just below the Moti Dungari. 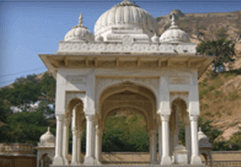 This is a modern temple built of white marble on top of a hill, dominating the skyline of south Jaipur. Just opposite the Albert Hall is one of the oldest ZOO in the country, harbouring different species of birds and animals. Not so old but definitely an exquisitely land scaped gardens with beautifully carved temple in beige stone, which is a vast complex with terrace sites all around and intricately carved marble columns and lattices. Located in the foothills of Nahargarh hills on the way towards Amer, this complex is a popular spot for picnic and film shoots. Sawai Jai Singh built it in 1728. The garden is laid in Mughal style and it depicts the legends of Radha and Krishna. The garden is located 8 km from Jaipur – Agra road .It consists of tiered multi-level gardens with fountains, watercourses and painted pavilions. Sawai Jai Singh built it for his Sisodia Queen from Udaipur. The palace house has several galleries, pavilions and beautiful murals depicting scenes from the life of lord Krishna. Vidyadhar Garden is a beautiful garden that was derived by the Rajputs of Jaipur from the Mughals’ definition of Garden. Vidhyadhar Ka Bagh was made in order to bring a sense of relief in the scorched scenery of the desert land. 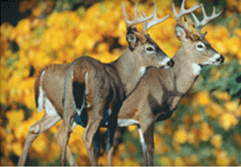 The Garden is situated at a distance of 8 km in the east of Jaipur, on Jaipur-Agra Road. Initially, the place served as a vineyard to previous rulers then it was renovated to its present form. 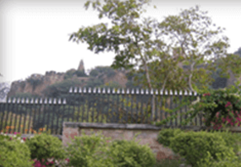 Vidhyadhar Gardens is the only well-planned garden in the Majestic city of Jaipur, Rajasthan. 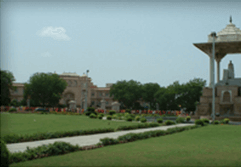 Vidyadhar Garden was built in the memory of Vidyadhar Bhattacharya, the chief architect and the city planner of Jaipur. The Garden has been designed as per the rules and edicts of Shilpa Shastra, the ancient Indian line of architecture, just as Vidyadhar did while planning Jaipur. 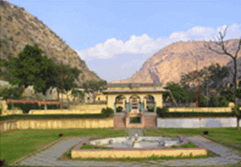 An ancient pilgrimage spot where the great saint Galav is believed to have spent his life and did his meditation; Galta Ji is situated 10 km from Jaipur on Jaipur-Agra highway near Sisodia Rani Ka Bagh. 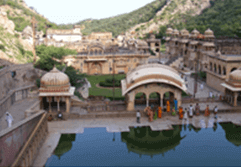 It is known mainly for its temples, pavilions, natural springs and holy ‘kunds’. The famous temples of the place include the triple-storied temple of Balaji, which appeals to the aesthetic sense of the visitors and is built in pink stone. Its magnificent structure looks more like a palatial mansion or Haveli. Situated amidst the low hills, is the Temple of Galtaji, which is also in pink stone and has a huge complex. Frequented by a large number of devotees, this beautiful temple boasts of a number of pavilions with rounded roofs, exquisitely carved pillars and painted walls. The temple is surrounded by natural springs and reservoirs that are considered holy and people believe that taking a holy dip in this tanks cleanse one of his sins.